Last year, “Jane the Virgin” actress Gina Rodriguez spoke out regarding the lack of leading roles for Latinos in studio films. Well, she got her wish for one with “Miss Bala”. But the fact that Sony is burying it on Super Bowl weekend – and that the film just isn’t very good – doesn’t show any real progress being made in the cause. “Miss Bala” is based on a 2011 Spanish-language film of the same name. Rodriguez does not play a woman named Miss Bala, but rather Gloria Meyer. She’s a Hollywood makeup artist who’s visiting her friend Suzu in Mexico. Suzu is set to compete in the Miss Baja California pageant. But while the friends are at a nightclub, a group of gunmen storm in and open fire. Through a real string of bad luck, Gloria is captured and forced to work for a cartel kingpin. How will she escape? Will she find Suzu? And how will female empowerment play a role in this by-the-numbers script? These are the burning questions that Rodriguez and director Catherine Hardwicke (of the original “Twilight”) try scorch into the minds of theater goers. But they fail to ignite interest on any level. The lack to energy in “Miss Bala” is stunning. The narrative drags, as Gloria finds herself on the wrong side of every single situation. I couldn’t help but zone out on a few occasions, as there simply isn’t anything to gravitate to. And we know exactly what’s going to happen in practically every scene long before the characters do. Rodriguez has yet to prove that she can be a fierce leading lady. The other big name in the cast is Anthony Mackie, who only has two scenes. One, unfortunately, teases the possibility of a sequel. 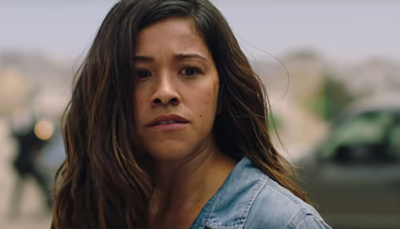 “Miss Bala” isn’t poorly made, technically. And some of its themes and messages are appropriate to the times. But the film has the overall feel of a late night, made for cable/Direct to DVD effort. If you’re looking for an intense, compelling and provocative action thriller, this isn’t it. “Miss Bala” is a miss. On The Official LCJ Report Card, “Miss Bala” gets a D+.